Antrim needed an late Tomás McCann free to rescue a point and finish unbeaten in their Division Four campaign. The Saffrons and opponents Louth had already secured promotion and places in the Division Four final before Sunday's match at Corrigan Park in west Belfast. Antrim looked to be cruising to victory but eased up and a Gerry McSorley netted a goal put the visitors ahead. McCann's fourth point levelled matters and the counties meet again in the final on Saturday, 23 April. The match had also been tied at half-time on five points each with Brian Neeson and Michael McCann getting two points each for Antrim. 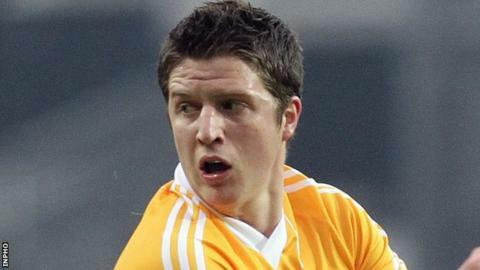 Neeson, a goalkeeper with Irish Premiership club Carrick Rangers, had to be replaced midway through the second half following a black card offence.